An illustrative example of solid state analysis. Chocolate might by many chocolate/lovers be regarded as a true drug, due to the instant effect on the mood – by to our knowledge this effect has not been verified in clinical studies. However, some studies do support some beneficial effects on the health, such as lowering of cholesterol levels, prevention of cognitive decline and reduction of the risk of cardiovascular problems. We will not contribute to this interesting discussion – but just use it is as a very interesting example of the exiting world of crystals on the microscopic level! 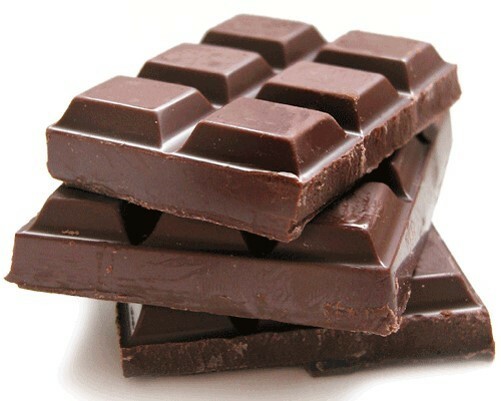 The cocoa butter in chocolate is known to have six different crystal (polymorphic) forms! The different forms melts at different temperatures, thus having the correct crystal form is essential when producing chocolate. The most commonly used for is Form V, which has a melting point of 33.8 C. which is a perfect temperature for melting in the mouth. The other forms melts at either higher or lower temperatures, which causes troubles in either storage or “taste”. In our small study the aim is to show how the various methods for solid state characterisation can be used. Even though cocoa butter is not a true drug, the same analyses should be performed for all drug substances, in order to be able to stay in control. First: Is the material crystalline or not? If yes, peaks will be observed on XRD. Such an analysis were performed on the sample of cocoa butter. As seen in the figure, more well defined peaks are observed. By comparison with the literature, i.e. comparing the peak positions, it is confirmed that this form corresponds to Form V.
Note: XRD is mainly used for ID, i.e. it is very difficult to obtine information about how the molecules are bound to each other. Further, a standard XRD run is not suited for quantitative analyses: Thus, small fractions of “other forms” will not necessarily be observed. It is possible to perform quantitative analyses using XRD, but this requires longer analytical runs – and method development to assure that the peak heights are proportional to the content of different fractions. What can FTIR be used for? The next analysis performed on cocoa butter was FTIR. This is a very old technique, which some people think might be “outdated”. However, FTIR is brilliant to get very fast information about special characteristics of the material – and is in general very efficient for quantitative purposes: In FTIR, the vibrations within and between the molecules are reflected: A change in crystal form will always lead to a new FTIR spectrum, and furthermore, the “shape” and position of the peaks will be informative in understanding the nature of the changes. 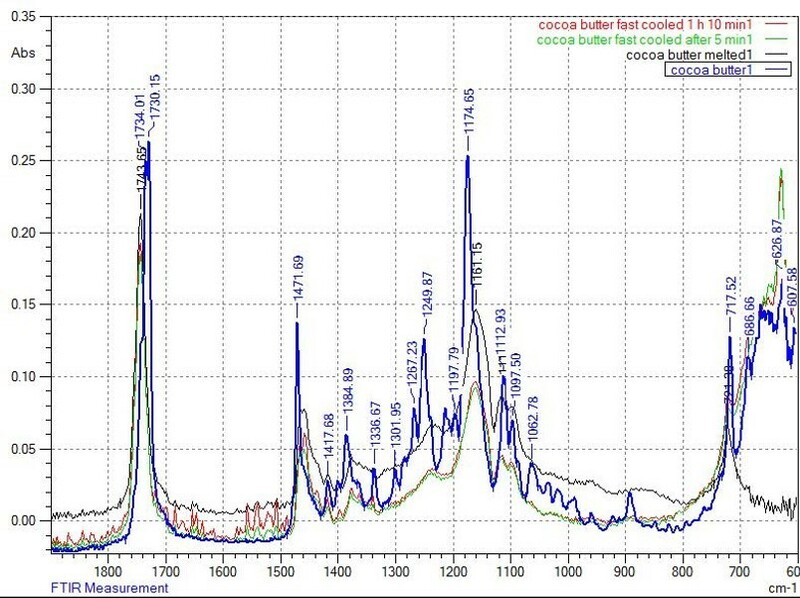 Below, the FTIR spectra of cocoa butter after different treatments are shown: The starting material (blue), after melting (black), after melting/5 min cooling in fridge (green) and after 1h and 10 minutes in fridge (red). It is observed that large differences are observed between the “original form” and the other forms. The main difference is that the peaks are more well defined for the starting material, which is characteristic for a crystal form. 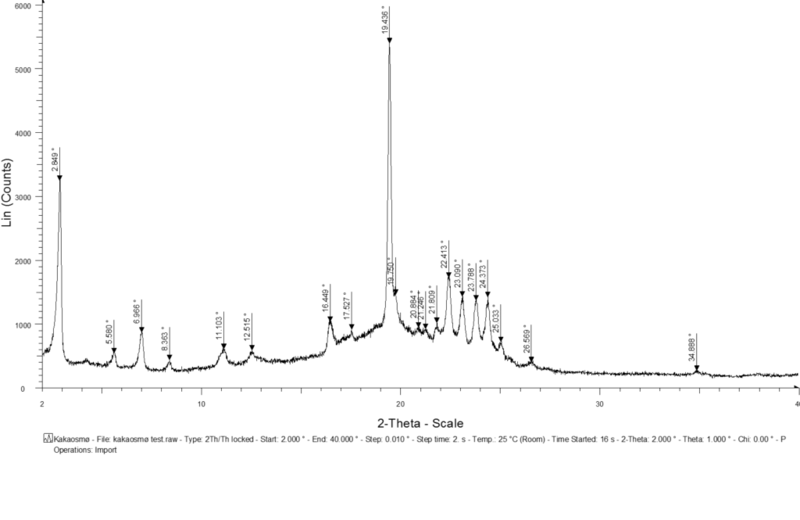 When melting the cocoa butter, the peaks become much broader, which is characteristics for a non-crystalline (amorphous) form. What is more surprising is that the cocoa butter remains in the same (amorphous) form after 1 hour in the fridge, thus recrystallisation takes time. In order to produce new forms or solvates, this information is useful, as the amorphous form is a good starting point for all other transitions. Thus, if this was a drug, it would following be considered to try to mix the amorphous compound with, for instance, various solvents to see if new crystalline forms would be formed.